Some of you have already heard my story about Counselors Academy so I understand if you want to move on – there is a distinct possibility I have told it about 1,549 times. For those of you who haven’t, I’d like to talk about taking risks and hoping like hell they pay off. I started Big Leap Creative in 2004, and added an employee in 2007. Most of my clients at the time were luxury resort developers so in 2008, when the economy tanked, need I say more… I had to lay off my one employee. This of course, bummed me out, because I was trying to grow and build a small team. I started to realize that even though I’m good at what I do, I don’t know how to run the business of what I do. I didn’t know things like: What is the financial backbone of a PR agency? How do I go from one person to a second? and then keep growing? How do I analyze my own financial statements? Where should my margins be? How much revenue per employee? What are other questions I should be asking that I don’t even know enough to ask? 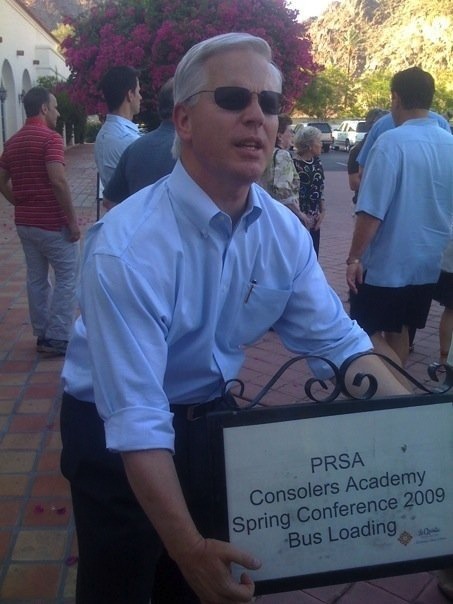 Late in that ill-fated year, a brochure landed in my mailbox for the PRSA Counselors Academy Spring Conference. The conference is directed at helping agency owners, CEOs, and senior-level managers to understand the business side of running an agency. One look at the programming in the brochure and I knew it was something I needed, but wasn’t sure if it would be a quality event (I had no ties to it whatsoever, so there was no social proof.) Would this be worth the investment of time and money? I really couldn’t risk the dollars or the time away from my business and not have it pay off in some way. I carried that darn brochure around in my work bag for months. It floated down to the bottom dregs with the spare coins and hair ties, dog-eared and wrinkled. But I kept looking at it. The deadline for early bird entry was end of April and I decided to give it time and wait for some sort of sign from the universe that I should go. I got my sign and a kick out the door by my husband; and boy am I glad I went. It’s truly the changed the way I do business and lead my life in ways I hadn’t even anticipated. I went thinking everyone was going to wonder what the hell I was doing there. I mean, come on, I’m a one-person shop based in a mountain town in Idaho. Surely, I’ll be surrounded by executives from New York, Los Angeles, and all over the country and I’ll be the outcast. Well, it turns out I was. And everyone kind of wanted to talk to me. One evening over cocktails, the CEO of a public affairs agency in Los Angeles said to me, “I just love what you are doing. Do you have any idea what the stack of work on my desk looks like?” Wait. This guy was envious of me? I ended leaving with something unexpected, more than knowledge – a better perspective – a stronger idea of my own story and that of the business I was and still am building. They want my life. My ho-hum existence circled around and slapped me in the face. Oh yeah. I guess it is kind of cool now that you said so. See, if we could just drop the preconceptions of who we think we are vs. who the others are, and recognize our own achievements, and package it up appropriately, we’ll notice we’re no better or worse than the others. Our life is our normal; but only to us. Embrace being the misfit. It’s what we want anyway, isn’t it? To differentiate? I learned much more than that. I had been working in solitude all these years, running my business and figuring it all out on my own. I suddenly had access to great minds in the industry and these “minds” have become truly great friends. Suddenly, I’m involved in impromptu conversations in the foyer talking about financial formulas and where you need to be in terms of revenue to be able to add another employee. I unabashedly pull out my notebook and scribble away. I didn’t learn this stuff in school, or at my previous jobs. Whether it’s Counselors Academy or something else, I urge you to follow that tugging, nagging idea in the back of your head to fill in your gap of knowledge. Do it even if you have to think about it for months and wait for a signal from the heavens or who knows where, to take that risk and get out of yourself to get a better idea of yourself. If you so happen to be a senior leader or independent practitioner in PR/digital marketing regardless of the size, I’d love to see you there. This year, it is June 9-11 in Austin, Texas. You have until May 10 for the early bird registration so go ahead and carry this blog post around with you until then. *PS. This post is in no way sponsored nor is it an affiliate link. I’ve just consumed the Kool-aid and think you should too. Also, that’s Scott Farrell of GolinHarris pictured above. We were dying laughing at the typo in the sign. Especially in 2009, it was rather prophetic. Maybe I have heard this 1,549 times, but I love it more and more each time! I’ll never forget meeting you there for the first time and hearing the story of you starting Big Leap Creative and…. crying! Yes, you had such an inspirational story that you made me cry, damn it. I’m so glad we both have become involved in Counselors. What a wonderful support system, and the annual conference has become my professional development event of the year. I’m extra glad that I have you as part of that support system, and that you’ve become such a dear friend. and i couldn’t believe you called ME afterwards for advice. ME!!!! Good stories are worth telling again and again. And all of us that “have swallowed the Kool-Aid” have our own story. Late night chats by the pool, early morning coffee before others arrive…all part of the CAPRSA experience. The magic continues post conference with the email conversations, late night chats over skype, early morning texts — however you choose to experience CAPRSA, just do it. You won’t regret it.